Members of the United Methodist Council of Bishops, spouses and guests (including Rev. 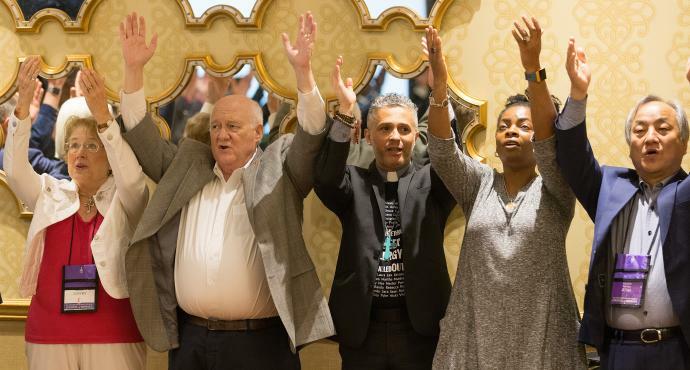 Alex da Silva Souto, center) join in the "Praying Our Way Forward" closing worship at the United Methodist Council of Bishops meeting in Chicago. The council deliberated on its final proposals to next year’s special General Conference that will address decades of division over how the church should minister with LGBTQ individuals. 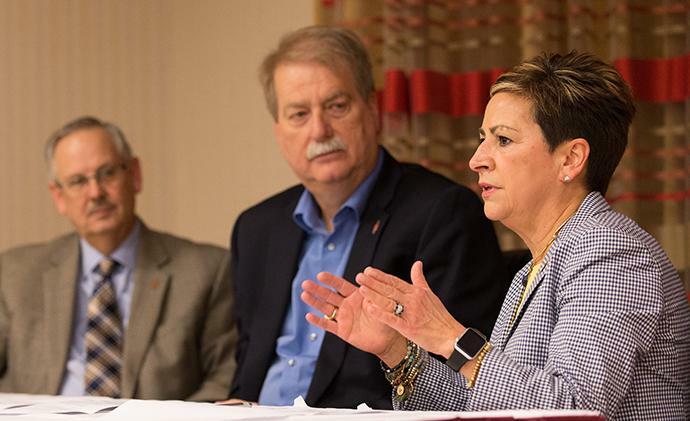 Bishop Cynthia F. Harvey (right) answers questions during a press conference about the United Methodist Church's Way Forward plan to address how the denomination ministers with LGBTQ individuals at the conclusion of the church's Council of Bishops meeting in Chicago. She is flanked by Bishops Bruce R. Ough (left) and Kenneth H. Carter. Photo by Mike DuBose, UMNS. “Unity is a gift from God, but it’s also something you have to work for,” said Florida Area Bishop Kenneth H. Carter Jr., the newly installed Council of Bishops president, during a press conference. He added that he is hopeful for the process. Carter is one of three bishops who serves as moderator of the Commission on a Way Forward, a 32-member, bishop-appointed group that has advised the council on possible options forward. The bishops do not plan to release their vote tally on the One-Church Plan, said Dakotas-Minnesota Area Bishop Bruce R. Ough, outgoing Council of Bishops president. Before heading to General Conference, all three plans still may face hurdles. At the bishops’ request, the Judicial Council — the denomination’s top court — will meet May 22-25 to address any requests stemming from the bishops’ submissions. The bishops also are requesting the top court have an oral hearing as part of its session. The bishops have not yet determined all the questions they will ask the Judicial Council, Ough said. The church court already has agreed to the bishops’ request to rule on whether other petitions — in addition to the report from the Council of Bishops — can be submitted prior to the convening of the special General Conference. The deadline to submit petitions to General Conference is July 8. The bishops’ recommendation aims to bridge a decades-long division that has grown so intense that, during the 2016 General Conference, rumors of a potential church split over homosexuality reached a fever pitch. General Conference authorized the bishops in a 428-405 vote to form a commission to advise them on possible ways forward that foster unity. The Council of Bishops executive committee later detailed “the mission, vision and scope” of the Commission on a Way Forward. Louisiana Area Bishop Cynthia Harvey, the bishops’ president-designate, said that she and her colleagues have lived with that framework throughout this process. “It has had life beyond what I think we ever imagined,” she said. The Rev. Mark Holland, a General Conference delegate from the Great Plains Conference, attended the bishops’ meeting on behalf of his delegation. At General Conference 2016, Holland made the motion that eventually led to the bishops launching the Way Forward process. He is pastor of Trinity Community Church, a United Methodist congregation in Kansas City, Kansas. He has been blogging urbanecclesiology.com about his experience at the meeting. For his part, Holland said, he supports the one-church model. “There is no model that is unproblematic,” he said. But he said is not fearful of the debate moving to the local-church level. Carter sees strength in diversity.